Renew the relationship with your gut! Your inner instincts guide the way toward a strong, fierce and conscious practice. Make self love cool again! Strange… I didn’t receive an email for day 30. I always look forward to your email, but this morning I didn’t got one. I didn’t receive the Day 30 e-mail either :(. Since it seems that I am not the only one, I suppose a technical issue is to blame and we’ll get the emails as soon as possible. Or at least I hope so! The e mail arrived but at nine instead of 7, maybe yours has arrived now. I’m in England by the way. Have you considered a 365 days of yoga revolution Adriene? woot woot! agreed, so on board for 365 days – lol! I also want a 365 days of yoga! Haha I will just have to create my own with the videos on here. Yess!!! It arrived here too! Thx! So funny, my little dog Marina started responding to Benji’s barks. As,always a very nice start to the day. Girl, you have found your place on this planet and thank goodness you did. What a lovely practice. Thank you. I loved hearing Benji barking during savasana. Learning so much about myself from this practice, so many life lessons. I am excited about Day 31 but a little sad, but the Revolution will continue. Among all other good things about the revolution, I appreciate how the outer world – be it the weather, the pets we share our houses with or the political situation – are reflected (upon) in both e-mails, videos and comments. Even though subtle, it reassures me that everything is connected, and that even though we are all alone, and may sometimes feel defeated or powerless, we are alone in oneness. We are affected, affiliated and involved. We matter. We are allowed to care. Even though this is all obvious, I am still truly grateful to be exposed to this matter of course nowadays. Love being included in all your partaking, interferings, reflections and connections, guys. It is (and you are) beautiful! Would it be at all possible to get a version of Day 31 with Adriene voicing over instructions? 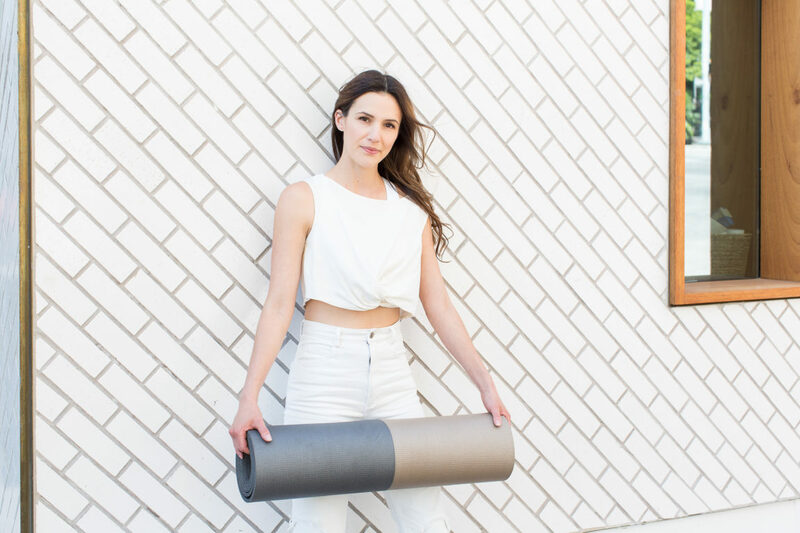 I know the idea is to encourage our own yoga practice, but I really love my Yoga WITH Adriene and am honestly so so happy to follow along with the videos. Having no instructions on Day 31 (which was also what Yoga Camp and 30 Days of Yoga did) makes me like the final day least, which I imagine isn’t really the idea of the culmination of the challenge! love love love yoga revolution! Been on my mat for 17 years now and I have never found this ….”YOU” ! Studying to become a Yogi Master and you have taught me so much. Day 31 here we go ! love and peace to this beautiful Yoga community. I have absolutely loved this journey, I’ve been quietly following every day but had to post today. I was almost in tears at the end of the session thinking that tomorrow was the last day. Putting all my faith in Adriene that we will be able to continue after this! Very mixed feeling today…so grateful for this revolution journey. I love it so very much! But sad that it is almost over…excited for what’s to come!! So many emotions! Yeah! I did get an email. Great words of wisdom and great get your blood flowing practice! I love see what new outfit Adriene will be wearing everyday. Love these pants! Just part of the fun! Thank you, Adriene, what a blast I’ve had with your Revolution Series of Delight! SO Lovely and Yummy…instead of considering the end of 31 days, I will make tomorrow A Revolution of A New Me!! Don’t sweat the small stuff, Adriene! It’s All Good and imperfection makes life Real! You’re amazing! Everyone here is Pure Love! Peace! That cue to “bring awareness to your third eye” lead to my most stable, longest Crow hold yet. Truly revolutionary… Thanks again, Adriene! Thank you so much for the time and effort you have put into yoga revolution and thank you for sharing your journey with all of us. Todays practice was a smooth ride, I didn’t even feel like I was doing yoga if that makes sense. I was flowing like water and felt so breezy too. Even though tomorrow is technically the ‘final’ day it does not feel like it at all. You have inspired me to keep showing up for myself and it has certainly become a habit to me to take time for myself to jump onto the matt. Just like brushing your teeth is important. Thank you so much again for your hard work and committed. Thank you so much for leading me on this journey. I’m excited for what’s to come. You mentioned kids yoga today and I’ve been looking for some kids yoga videos for my 4 little ones (5yo, 7yo, 8yo, 10yo). Can you recommend some kids yoga videos while I wait for your kids yoga to be available? My dog Copper heard Benji barking and she started barking back at him <3 The past 30 days have been a wonderful experience for me, and I hope I can continue a daily practice after Revolution is complete. Thank you for your guidance! Dear Adriene, you mentioned that you have had tailbone issues and so do I (for four years now)! And I was wondering if you have any tips or exercises that have helped you? I am doing yoga with you since last summer and it’s really good for my tailbone, I have to say! I am so happy that I found you and every time I bow my head at the end of the practice and say Namaste I send you a little love. I am very happy for this revolution of 31 days with you Adriane. It has been beautiful to receive your emails with your beautiful words at the exact moment. I want to continue to tune every day with this internal and external revolution that is helping me to be a better person. It was so wonderful to end this practice with laughing so hard at Benji’s bark! Thank you with all of my heart for this incredible Revolution, Adriene. All of my heart. Thank you Adriene for fabulous 31 days. I’m about half way through with the program day 15. I have loved every minute even the days my beginner self couldn’t do. I’ve tried to go back and practice the strength days multiple times by doing a new day plus a day I couldn’t do completely. This practice has been so soothing during this time of transition in the US. I can’t believe the country chose such an inconsiderate unthoughtful person for our president. He needs Yoga. Thank you again for all your efforts and work on bringing us this great practice. In december i started with 30 days of yoga. I remember saying im never going to be able to do Crow. Well i did it second time it came in yoga revolution. It was today i was telling people at work im never gonna be able too do the elephant pose (bus stop 4). Thanks to you and your slow intake how to look and think about it… I did it today on both sides. And its not only about poses. Each lesson passes like 5 minutes. It makes me think different, walk different, stand different. And I love it! Maybe its 31 day revolution but I will do my best to keep it in me and in my everyday practise for the whole year (or life, hopefully). Just one more day! I got sick in the middle of this and my internet was shaky for a couple of days and I fell behind. I worried about catching up and I didn’t want to make this into a checklist to complete. I fell into a depression and not long ago and whenever I couldn’t do a lesson the next one spoke to me like you were there. Like you knew what I was going through. I want to repeat this for February since I think I heard some of the lessons and didn’t fully absorb them until later when my heart was ready. Those were my aha moments. I felt it when my balance or a movement would become suddenly so easy. I would like to continue building that. Thank you Adriene for putting these videos out there. Thank you Adriene for the amazing Revolution. It was just what I needed this month. I even got my kids to do a few of the days with me. If you are looking for an idea for a project, Yoga for Tweens would be fantastic (there are lots of kids yoga videos online but I haven’t found a could one that isn’t too childish for my 9 year old. Also, as I am sad to see the Revolution end and don’t want to lose momentum, I want to make sure I stay in the loop with any suggestions you might make about where to go from here. I have signed up for your weekly email twice but have never received it. Anything I can do to correct that? I am in Canada in case that makes a difference. I have been absolutely loving this yoga revolution. I’m sad that it must come to an end… like all good things. But yes, inspired to continue. This practice has brought me so much and for that I am very grateful. Thank you Adriene! I agree with you Line, I can’t believe plank feels good now! Thanks again Adriene for everything! Haha I was just about to ask about this, but I’ll trust you! This has been really amazing and I’m astonished at how quickly my practice has grown. Thanks for everything you do for us Adriene! “It’s about cultivating a relationship with your inner teacher”. That is really cool. This daily yoga practice, be it 15 minutes or an hour and 15 minutes is doing just that. I am becoming more and more aware of my natural tendencies on both sides of the coin you might say. I’m realizing that core is key. So for the month of February I am focusing on the first three chakras, both front and back – Muladhara, Svadhisthana and Manipura. Of course I will also be doing full body asana practices but I’m committing to core work in February. This is what my inner teacher is telling me- to commit to a particular practice. Core work needs to be that commitment for now. Love and light!! So thankful for today’s practice! It felt like everything was coming together and it also felt like it was not Yoga at all and at the same time the realest Yoga I ever did – if that makes any sense at all. For me, it did 🙂 I managed to stay in Crow Pose, but that wasn’t even the greatest thing about today. The flow and the breath and the movement that made me feel real and alive felt so incredibly good. Thank you Adriene for your amazing work! Hi Benji! My Sammy heard you and gave you a shout out! Really nice practice today. Thanks Adriene! My practice started with my dogs barking, ended with yours… all is good in the world! Awesome practice today! I had a total “Aha!” moment with a most excellent feeling of connect through the entire length of my body at the beginning of the practice, and I absolutely loved ending the practice with my two dogs barking “Namaste!” back at Benji! Put a huge smile on my face 🙂 Lots of love! J’avais froid lorsque j’ai commencé…. Maintenant, j’ai chaud. Je suis bien. Merci! Love that you brought back the leg baby! I was thinking of that the other day and it made me chuckle. Today I managed the eight angle pose on one side but not the other, but that’s ok! Through this series I have learned so many things… Among them, to be more conscious of moving from a place of connect – a strong core, back and front – to move with grace and ease rather than being a yoga robot. To believe in myself and not be scared of falling, but also to not scare myself into falling! I must admit, I’m a little sad about tomorrow and having to start again. But the practice is all about beginning again! Thank you for all you do, Adriene. Know that you are touching lives all around the world, and helping in more ways than you know. I started with your 30-day challenge a year and a half ago after a mastectomy and reconstruction following a breast cancer diagnosis, and your videos have become an important part of my daily practice. My cat has spent the last 30 days checking out what I’m doing and either leaving within minutes or curling up in the corner and sleeping while I practice. Today, she joined me on my mat and stretched in only the way cats can, in the past I would have allowed her to distract me, tonight, I treated her as part of my practice. It was beautiful. I honestly didn’t feel like I was improving or changing much over this month until today. I mean, every day felt good in its way, and I felt better for having done it, but things have been crazy and I haven’t really been able to “drop in” and give it the attention I wanted to. So I was just hoping to maintain, and survive this month. Yeah, I’m a day behind but I had a breakthrough moment! For three whole seconds, I held my crow!!!! Woo hoo, today is going to be an awesome day- Bring it! Thank you Adriene for all that you are. Thank you for this revolution. Thank you for your guidance. Thank you for your humor and your love. I finished all 31 days and look forward to yoga every day. I’ve been trying to get into the habit of it for a long time but I always stopped for some reason. I supposed I wasn’t ready. I feel great after doing this for 31 days. I feel lighter, I feel more grounded, I feel more present and peaceful. I feel like I have a sanctuary of peace to turn to whenever I need it which is so important for this time. I feel more love for myself. I catch myself complimenting myself more and cheering myself on. I feel more patient and understanding of myself and others. Its amazing what can happen after just 31 days. So, whats next? Yoga camp, 30 days of yoga, and as many yoga videos as possible so I can continue this journey and become even more of who I really am. Also, I just wanted to say you are very graceful in your practice. Your flow is hypnotizing and I hope to meet you in person one day! Thank for this great practice. Another amazing one. Thank you, Adriene! My kids can’t wait for the kids videos!!! Thank you for this lovely practice! I am working on the reconnection with my inner teacher, so this practice was just perfect and timely. Benji’s salute was really neat! What a great practice! When Benji barked during the Srivasana, my three pups all started barking in unison, joining him in a chorus of dog sounds. Loved it! Made me laugh. Thanks for all your wonderful yoga practices Adriene, and for sharing yourself with your FWFG community! Love you. Loving the charkra power explanations thank you! Just wondering if you would happen to have the name of a great resource book at all that I can read over? I have loved this chakras practice and am planning to explore Adrienne’s videos on each one, but I’m also looking for a recommendation for a good bock I can read about them. Any suggestion is greatly appreciated! Thanks! the best yoga classes i just love it i do it everyday it has been a year and a half and i will not give up you go girl namaste.